Just like all other mobile OS, software errors and issues is one thing you almost can't avoid on your Android smartphone. 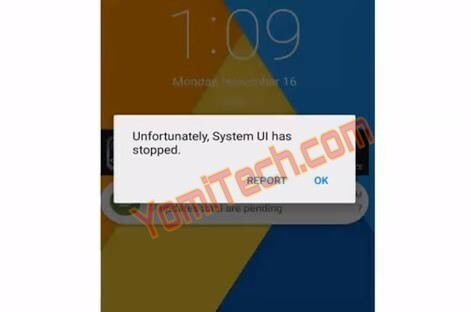 When you get the "Unfortunately, System UI has stopped" error message on your Android phone, it affects the phone's operation and can make it become less or none responsive. This issue can actually come up on any Android phone irrespective of the brand or the Android version. There are several possible causes of this error and in this post, I will be sharing some likely solutions. Restart your Phone: Although this won't always solve the problem but sometimes it helps. So if the "System UI has stopped" error message pops up on your phone screen, it's advisable you try restarting your phone first and if that doesn't work then you can move to number 2 solution. Uninstall third party launcher: Sometimes your third party launcher might conflict with your system UI mostly because your system is not granting it sufficient permission to function properly. In cases like this, try to uninstall your third-party launchers like Nova, Apex etc and restart your phone. Uninstall Recently Installed Apps: Aside launchers, your regular apps can also conflict with your system UI. Once you notice that issue, identify your recently Installed Apps and uninstall them. Uninstall Google Apps Update: Google app update is one of the most likely cause of this error message. It's either the update is buggy or isn't compatible. * After that, just go ahead and restart your phone. If the above fix doesn't work, then you can try this out. * Click on the menu and select show system Apps or tap the System tab (depending on your phone). * Search for System UI. * Click on it and click clear data. Perform Factory Reset: If all the proposed solutions above doesn't work for you, then you might have to format your phone. You can perform a factory reset on your phone by going to phone settings >> Backup and Reset >> Factory Data Reset. Reflash your Phone Firmware: Although factory resetting your phone ought to solve the problem, but just in case that also doesn't work then you might need to flash your phone's firmware or ROM. To do that, just download the correct firmware for your phone and flash it with the suitable flash tool compatible with your phone.